EVANSTON, IL. The Chicago Force couldn't have asked for better weather for their home opener Saturday against the Indy Crash - 78 degrees at kickoff - but it seemed like the Force was disoriented by the unfamiliar sun. Unlike last week's road game in Detroit, the Force was sluggish in the first half and the offense was out of sync. After an exchange of possessions, Chicago started their second drive at their own 48 yard line. 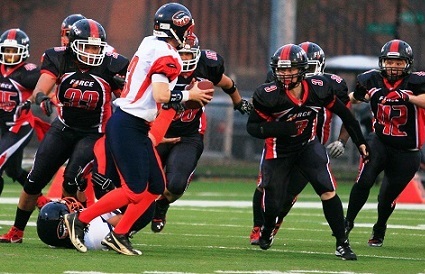 Linebacker and running back Darcy Leslie then kick-started the offense on third down when she took a pitch to the right side where she was met violently by an Indy linebacker. Leslie bounced out of the tackle, reversed field and picked up 37 yards to the Indy 10 yard line. Leslie took the handoff on the next play and stormed into the end zone for a touchdown. Jeanette Gray carried the ball in for a two point conversion to put the Force on the scoreboard 8-0. On the ensuing kickoff the ball was misplayed by Indy and Elisha Okrey recovered for Chicago at the Indy 37 yard line. Running back Mary Choules carried three times for 22 yards, moving Chicago into the red zone. With the power offense on the field, Gray took the snap on third down and scored on a 4 yard keeper. Gray then handed off to Leslie who easily scored on the two point conversion attempt. Chicago 16, Indy 0. Despite good field position from a short kickoff and two penalties on the Force, Indy was unable to finish their next drive and turned the ball over on downs at the Force 36 yard line. Grisafe kept the chains moving with several completions to Gray but then threw an interception in the red zone. Indy was not able to do much with the opportunity and Chicago got the ball back at the Indy 40 yard line with 3 minutes left in the half. A completion to Gray moved the chains, and then a great grab by Stephanie Precourt at the 8 yard line brought the crowd to their feet. With the power offense again on the field, Gray finished the drive with a 1 yard touchdown. Leslie was unsuccessful on the two point attempt. Score Chicago 22, Indy 0, and the half ended with no further scoring. Indy's first possession in the second half was from their own 9 yard line. On third down the Indy QB threw a short pass over the middle and linebacker Melissa Nelson intercepted and returned it to the Indy 6 yard line. On third down Grisafe scored on a 1 yard touchdown run. Leslie was tackled for a loss on the two point conversion attempt. Chicago 28, Indy 0. Chicago would score three more touchdowns in the second half on a 1 yard keeper by Grisafe and 2 touchdowns by Gray, one on a 20 yard reception and another on a 65 yard punt return. Gray also had another touchdown called back on a questionable penalty on a kickoff return. Gray was named the Offensive Game Day MVP for her 207 combined yards for offense and special teams, to go with her 4 touchdowns. 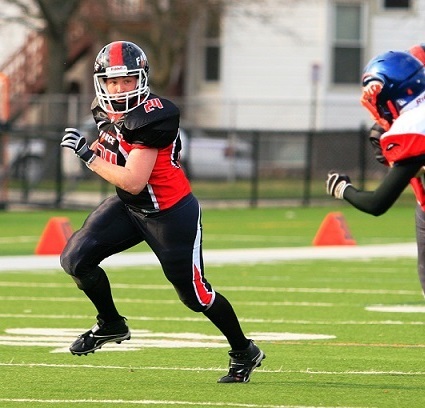 Indy's lone touchdown came in the 4th quarter when their speedy running back Lea Kaszas reversed field and outran the Chicago secondary to the end zone. The Force defense held Indy to 96 yards of total offense, though they were called for several penalties, three of which gave Indy first downs to extend their drives. Darcy Leslie led the defense with 11 tackles and a sack, and was named Defensive Game Day MVP. The Force are on the road this week as they travel to Washington, DC for a huge conference match up with the DC Divas. The Divas are one of the top teams in women's football, this will be the first meeting between these two powerhouse franchises. Kick-off is at 6pm EST. 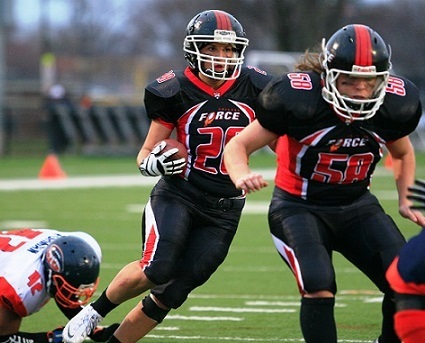 The next Force home game is April 26th against divisional opponent West Michigan Mayhem. Game time is 7pm at Evanston Township High School. For tickets and more information please visit chicagoforcefootball.com or call Sam Powell / Game Day Operations at 312-371-7813.